Experience the beautiful sights and wonderful flavours of Echigo Tsumari in late autumn, through a Japan-Australia culture exchange program. Features workshops, lessons, and a sports festival with local people from the Urada area. Autumn has arrived in the Echigo Tsumari/Urada region, where Australia House is located. Here, autumn is a time for people to recover from the physical energy expended on the rice harvest, and to spend some time enjoying the flavours of the season as they prepare for the winter. It’s the most relaxing season of the year.Australia House will hold its ‘Autumn Gathering’ as an opportunity for people to interact with local Urada residents, while enjoying the essence of autumn in the countryside, during this two-day program. Activities include workshops to create seasonal handmade goods under the instruction of local Urada teachers, lessons in Australian cooking, and other workshops at Australia House. Another characteristic autumn event in Japan is the school sports festival. The Autumn Gathering will include a sports festival with classic games like tug-of-war and tama-ire (ball toss), for Japanese and Australian participants to have fun together through physical activity. Guests will then be treated to obento boxes made with new crop rice and delicious autumn specialties. Participants can choose which day and which programs they would like to join. 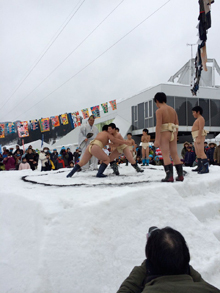 Check out Nic Wilson's diary on the Snuff puppets' amazing outcome in Japan. Today is the half-way mark of our People's Puppet Project in Urada. One week into the workshop and we have the makings of six giant puppets, a wealth of narrative ideas and imagery, a unique and beautiful mix of sounds and musical ideas, and a diverse and talented team of residents who are getting really excited about their performance next week. Through discussions with the community, we decided on six puppet characters to begin work on: Jisa and Basa (Urada grandparents), Magomusume (their granddaughter, a fashionable Tokyo student), a Kamoshika (the amazing-looking Japanese serow), an Akashobin (the iconic Ruddy Kingfisher), and a Kappa (a troublesome mythical water sprite). We've explored the local environment, our imaginations captured by this climate of such extreme seasons, intrigued by the details of small-town culture in an ageing and dwindling population. The warmth and generosity of residents as we dove head-first into folk-tales and old family homes. Some local stories have been put on as annual school plays here since the old folks were students themselves. The Kappa is shadowing us in silence, our sixth member. It was clear instantly that this would be a two-way creative exchange: we've been treated to intimate Taiko, Chindon and loungeroom Karaoke performances, been invited to share in local mythologies and artforms, brought home-grown fruit and veggies, been shown how to make costumes out of last season's rice straw, and even taught some shoe-weaving skills by Urada women, making our own beautiful braided slippers from disused old bed-sheets. On the surface the Urada narrative is one of departures, and its location is the past. We learned for instance that the population has dropped from 2000 in the 1960's to 300 today, with an average age pushing on 70. The 2011 earthquake was the last straw for many households: a small exodus, we are told, of families desperate but unable to stay. Our workspace is not only the gymnasium of an abandoned school, but also the emergency camp where the earthquake victims gathered on that early Spring night and slept like one big family on the floorboards. But the personal stories from our workshop group paint a different image, one more human than statistics and more colourful than disaster: One participant, 30, told us how he came back here from the city after the earthquake to help rebuild, and was so inspired by the strength and cooperation of the community that he found here that he repatriated. Our amazing young translator and her boyfriend are recent tree-changers from Tokyo who are learning to farm rice, choosing the serenity and community of Urada over the noise and convenience of the city. Our abandoned gymnasium is the home of a nine-strong children's Taiko drumming group. For all we've seen they could be the only nine children here: what they lack in numbers they make up for in community spirit, creative passion and musical timing. Their rehearsals in the gym have been dynamic, and their performance this week at Noh Bu Tai was a real treat to watch. The elderly residents have told us they take pride in all these things, and also see in them a very real hope for the future of Urada. So these are the ideas inspiring our work as we enter our second and final week of development. The landscape, the building we work in and the people who come; the folktales, but more importantly the folks who are telling us the tales. They are Urada's present. The adults returned, the children grown up, the dormant classrooms erupting with noise. We can't wait to see where they take it. We'll find out next weekend. Have a look at www.snuffpuppets.com for more info and pictures in the coming weeks. Nick, Rosalind, Andy, Stéphane and Ignatz. 4. Andy and Stéphane weaving their slippers. 5. Us with our teachers. 8. Rosalind working with the young musicians. 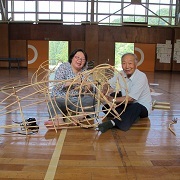 The 2015 Asialink Artist-in-Residency “Snuff Puppets” are currently working with the local people of Urada to make the “Giant of Echigo Tsumari” which they will perform on 16 August at Nobutai. Aboriginal art panels of the “Yiwarra Kuju: Canning Stock Route” exhibition from the National Museum of Australia collection is currently exhibited at Australia House. First surveyed by Alfred Canning in 1906, the Canning Stock Route runs almost 2000km across Western Australia. Its establishment dramatically affected the lives of the Aboriginal people who lived in the regions traversed by the route. The exhibition tells a story of the place where Indigenous and non-Indigenous histories intersect. Australia House Residence Program Artists, Heidi Axelsen, Nathan Hawkes and Hugo Moline invite you to help create a new work for 2015 Triennale. *Following the event on the 12th we invite all participants to join us for a BBQ at Australia House. I am the Executive Producer of Snuff Puppets, a giant puppet performing arts company. 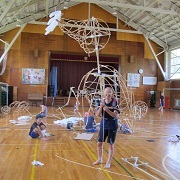 We are the lucky recipients of an Asialink Residency grant to present a giant puppet spectacular, created in collaboration with the local community in Urada, to be presented as part of the Echigo-Tsumari Trienniale. I visited the region in May to meet the producers of Echigo-Tsumari and the people of Urada to discuss the project. I had the joy of staying at Australia House for the night. I got a chance to drive around and see the sculptural installations in the landscape. While the weather was lovely there was still snow, which I don't a chance to experience much in Australia. Driving to Australia House, turning the corner, you see the beautiful building rising from the trees and complementing the natural environment. Inside it's just as inspiring with beautiful wooden interior. I had such a lovely time and it was great to meet the local community as well as two other artists participating in the Trienniale. A special thanks to Yoko for welcoming me to Australia House and introducing me to the neighbours. I can't wait to return in August! The AJF is pleased to support the performing arts residency organised by Asialink in conjunction with Tokyo's Art Front Gallery, of the exciting Melbourne-based company - Snuff Puppets. This residency will be conducted at Australia House during the 2015 Echigo-Tsumari Triennale in Niigata. The Australia House/ETAT residency will be the first time they have returned to Japan since 2002. Experience the beautiful sights and wonderful flavours of Echigo Tsumari, in this late Autumn home stay and sports festival weekend gathering. The International Culture Appreciation and Interchange Society, Inc. will host a charity concert on 10 October at Reinanzaka Church in Akasaka, Tokyo. Proceeds from the concert will be used to support young Australian artists, including those at Australia House, and the children in Fukushima. Well-known tenor, Kazuaki Osawa, will showcase his expressive voice and impressive vocal range. 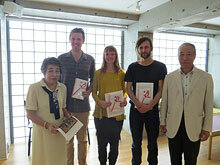 The second Asa Matsuoka Award was presented to the three artists participating in the Australia House Artist in Residence Program 2013-2015 by the International Culture Appreciation and Interchange Society, Inc. 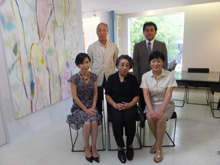 The Asa Matsuoka Award, named after the founder of the society, is awarded to emerging Australian artists as part of efforts to promote friendship and goodwill between Japan and countries in the Oceania region. The award, accompanied by a letter from Society President Mr George W. Gish, Jr, was presented to the NPO Echigo-Tsumari Satoyama Collective Organization by Ms Yuko Matsuoka , Executive Director and daughter of Ms Asa Matsuoka, board member Mr Shuzo Hatori and member, Professor Muneaki Samejima. 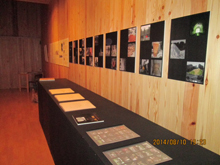 Australian books and panels of past projects are on display at Australia House in Echigo-Tsumari until 17 August. Please come and discover the history of Australia House! 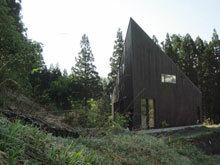 2015 Asialink Arts Residency Applications for Australia House, Echigo-Tsumari Art Triennale Now Open! It was inspiring to be part of an event where a genuine respect for tradition combined so comfortably with fun, hilarious and hectic team events. The food was also delicious! We have arrived back in Urada and the snow is amazing! We were welcomed very warmly by the people of Urada with an amazing welcome dinner party. It was so good to see our old friends again and the meal was so delicious! The next day we held a workshop at Australia House. The young people of Urada helped us prepare four snow caves which we combined with eucalypt leaves from the Australian summer we just left to create small sensory installations. Afterwards everyone helped to build a huge snow-hut with candles. We had a fire and the local ladies prepared a delicious stew. Maruyama-san and the Mayor of Tokamachi both spoke and the Jørn Utzon International Architecture Prize was awarded to Australia House. A local band called ‘kiori-oktai’ (collaboration) played some very beautiful songs by Hibari Misora and the kids took turns sliding down the hill behind the house on tabogans. It was a great day that everyone helped to make together. The three Australian artists, Hugo, Heidi and Nathan are back and will start their two-week winter residency at Australia House on 22 February 2014. Through their residency they will again conduct research for their Echigo-Tsumari Art Triennale 2015 project, and will work and collaborate with the local community. Their first workshop will be held right after they arrive, with the Urada Community youth organization. 15:00 Winter Gathering: (refreshments and music performances): Australian style cheese steak and mulled wine will be served. Women from the local community will also prepare hot tonjiru soup and onigiri rice balls. Two local bands will perform. The Autumn Gathering at Australia House was held on 10 November. The snow fences were put up in about an hour thanks to the speedy efforts of everyone involved. Participants enjoyed a delicious autumn lunch with onigiri rice balls made from newly-harvested local rice, accompanied by mushroom and vegetable soup. 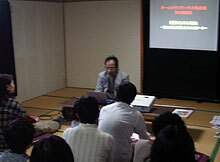 Lunch was followed by a seminar about Aboriginal art by Fram Kitagawa. Aboriginal art expresses creation myths known as the "Dreamtime" and, according to Mr Kitagawa, Aboriginal people - and all human beings - have the memory of their ancestors in their DNA and we are able to see them in our dreams. Everyone enjoyed a fascinating conversation about dreams. 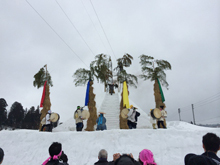 Despite the occasionally heavy wind and rain, everyone had a pleasant time learning about people down under and thinking about the history of mankind and the world of dreams as they prepared for the winter in Urada - located in the Echigo Tsumari region. Apparently, it snowed the next day so Australia House will be covered in snow for the next few months at least. Autumn has come to Australia House in Urada and we are holding a gathering to celebrate! 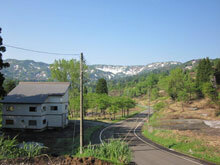 The Tsumari region is known for its heavy snowfalls and autumn is the perfect time to prepare for the cold winter ahead. Our speaker, Mr Tetsuro Iizuka, will give participants a brief explanation about snow fences and the community’s preparations for winter before demonstrating the installation of a snow fence at Australia House. This will be followed by a lunch featuring delicious onigiri rice balls made with newly-harvested local rice and mushroom and vegetable soup made by members of the community's Wome's Association. A seminar will be held in the afternoon – the latest in a series of talks about Australia for the local community. This time, Fram Kitagawa will speak about Aboriginal art. The seminar is open to everyone. This event will be a wonderful opportunity for both Australians and Japanese to meet and interact at Australia House. We look forward to seeing you there! 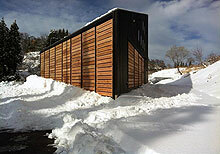 Mr Iizuka will demonstrate the installation of a snow fence at Australia House after the talk. 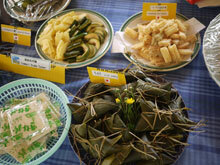 Participants can enjoy delicious seasonal dishes including rice balls made with newly-harvested rice, mushroom and vegetable soup and pickles. Participants are welcome to participate in either the whole program or each individual session. Please provide your name, contact details (phone number, e-mail address, etc), specify which sessions you wish to participate in (snow fence talk, lunch, seminar) and whether you wish to use the shuttle bus service. Bookings can be made by e-mail, fax or telephone. In preparation for our final week in Urada, we offered to accompany local people in their daily lives and to help with odd jobs. As it turned out people were quite happy to do their own odd jobs and we found ourselves being fed delicious delicacies instead! Izuka-san and his grandson Koya-kun acompanied us to all the visits to introduce us & help us with interpreting. Koya-kun is 10 years old and was a great teacher for us in both Japanese and magic tricks! 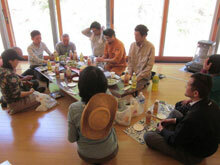 At Yuji-san’s house in the hills behind the village of Urada, he and his wife invited us their 200 year old house. Yuji-san showed us by drawing the way his house was originally built with giant river stones foundation pillars and treated us to many delicious home-made pickles and seaweed. Sato-san and his wife live further up the valley quite close the Australia House where he showed us his small factory which houses his machine for drying rice and storing potatoes. He also took us on an adventure into the nearby bush to dig out some clay. Nothing seems to tire these strong people, he whipper-snipped a 100m path through thick bush for us to find the clay at the base of a large tree. We now have a bucket full of earth to return to in the winter! The last visit we had was to Gombei-san's house who is the closest neighbour to Australia House. 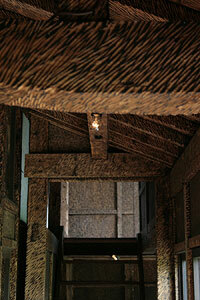 After a karoke concert in Gomberi-san's lounge room, he taught us to make hand weave straw sandals called 'warazi'. Looking back at our time here the most precious experiences have been the opportunity to engage physically in the act of making. 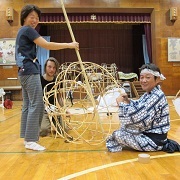 Doing and learning a choreography of movements, refined with practice and repetition, such as weaving slippers from rice straw, forging slender nails from metal rods, dancing at Obon. Creating by watching, imitating, making mistakes, perfecting and reaching an end to begin again. On Saturday morning we joined the weekly gathering of local old ladies down at Izuka San's supermarket. With Daisuke's help we chatting with them about the old days over pickles and tea before dropping them all home on the mini bus. They told us about the past in this region, the hardship but also the closeness of people. It was a very special experience for all of us. One lady, more than 80 years old told us we were the first foreigners she had ever met. In the final workshop we held at Australia House, we were interested in uncovering peoples sensory seasonal memories of Satoyama. We prepared a series of timber rods in three different length with a series of notches. On each face of a timber rod we asked people to write their sense memory, taste/smell, touch and sound of satoyama and then on the last face to write their hope for satoyama. 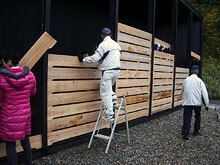 Each person then painted their timber rod and set about to make a structure together, finding a place for their contribution to fit in a whole. 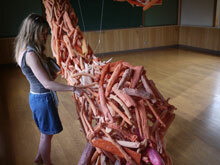 The result was a collective spindly and intricate structure held together by strings and notches. On our last days in Urada we visited several 'akiya', abandoned traditional farm house many of which are beautifully constructed with woven cedar rafters, yet are now shells with traces of the families that were there. We have been told de-population is a result of the rapid industrialisation in Japan and the decline in agriculture, though it is shocking to experience a place as beautiful as this being abandoned. Living so close to a land with 40 degree days in summer and 4 meters of snow in winter, is a tough environment for anyone especially the elderly. Yet they are the most vital old people I have ever met. There are so few young people here, as they seem to be daunted by the isolation and the 'inconvenience' of country life,and of course the lack of work. We have been told many times about the depth of the snow and can only imagine the weight and pressure this puts on the peoples lives and the physical infrastructure. We will get to experience when we return in winter next year for massive snowfall! 5. 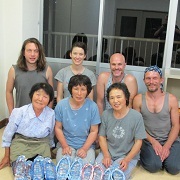 Weaving straw sandals with Gombei-san, one by master one by Heidi the 'apprentice'. Photo by Hugo Moline. After my restful week of quarantine, Australia House feels now like a kind of ship I have taken a long voyage in. Since disembarking we have spent the week days getting to know the amazing people, places and art of Echigo Tsumari. We had a great afternoon tea with locals coming from Urada, Joetsu and Niigata City. The local ladies cooked up an incredible feast of local delacacies including pickled baby fern, seaweed jelly noodles and red basil cordial. Oishi nee! We made pikelets with jam, not quite equal to our hosts' offering, but enjoyed by the kids! Further afield Yoko-san organised a great visit to the industrial riverside city of Sanjo. 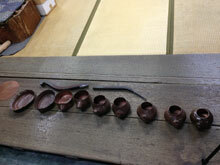 There we were taught how to forge Japanese nails and saw how a single circle of copper can slowly be beaten into a full kettle. We also met a man who runs an agricultural tool making factory. 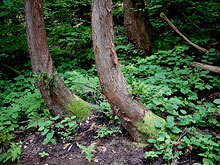 There are more than 10,000 types of hoe in Japan, varying by locality, terrain and soil type. Old farmers bring in their old hoes for repair and replication, adding to the factory's knowledge bank of hoe typologies. In many of the towns of the artfield the schools have been closed down due to depopulation. Christian Boltanski's haunting The Last Class and the Hachi community with Seizo Tashima's wonderful Walk-In Picture Book both had very deep impression on us. On 18 August, the event "Come have tea with us! - Aussie Afternoon Tea vs. 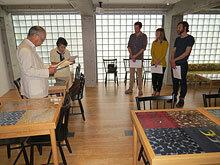 Typical Tsumari Tucker" was held at Australia House. Members and children of the Urada community, members of the Japan-Australia Society of Joetsu, the Niigata-Australia Association, and Ms Dara Williams, Minister-Counsellor of the Australian Embassy, participated in the event. Participants enjoyed the interactive event tasting Australian snacks prepared by Hugo, Heidi and Nathan and the homemade sticky-rice and pickled vegetables prepared by the Urada Community Ladies. Having to remain here at Australia house the last 4 or 5 days has really helped us tune into the sensory aspects of nature here in the summer time. The insects whir and shimmer all around, and approach an almost deafening frenzy when you walk a little deeper into the forest. There is a kind of architecture to this sound, like thousands of cells vibrating, creating an audible structure. The cicada's and crickets are the most obvious but their endless sound is punctuated by the sudden loud calls of other insects. It reminds me quite a bit of the Australian bush in the summer - soaked in an extremely humid heat. The other benefit for us of Hugo's flu is we can work downstairs while Australia house is closed, and the view down here is a feast for the eyes, and it is wonderfully framed by the black pillars of Andrew Burns' architecture. We were given a wonderful tour of traditional architecture today by Iizuka-san who owns a local construction company. This involved a visit to Gombe-san's 160 year house close to Australia House - what a treat to sit inside his and his wife, Sumie-san's beautiful home and have him sing for us - this man has an awesome voice! - he showed us up inside the roof of his house to see the way a traditional rice-straw thatch roof is constructed, and as we were leaving we were given a pair of rice straw thongs each made by Sumie-san - a perfect day! Hugo has been asked to rest here a few more days, but Heidi and I have just begun to drive around and visit some of the works that are part of the Echigo-Tsumari Art Field and feel completely blown away by the quality of what we have seen, the way the works engage so deeply with the local area. In following the map of artworks one traces the landscape of this unique place, its people and their traditions; the way the works are located all over this region encourage you to fully engage with the space between them. Needless to say, the opportunity to follow the trail around the Echigo-Tsumari Art Field is reason alone to visit Japan, but the chance to contribute is extremely exciting. Now we just can't wait to begin learning from and collaborating with the local people! Australia House will be temporarily closed from 10 to 16 August. The event "Come have tea with us! Aussie Afternoon Tea vs. Typical Tsumari Tucker", originally scheduled for 11 August, will now take place on 18 August. The "Get Creative at Australia House!" workshop scheduled for 18 and 25 August will now take place on 25 August only. We thank you for your kind understanding. This is now our third day waking up to the sounds of cicadas and many other buzzing bugs here at Australia House. Through the night there is a beautiful soft breeze that give sweet relief to the hotness of the days, it reached 36 degrees yesterday! It has been rich and a bit of a bumpy start to our residency here. Coming from Sydney's winter Hugo carried with him an Australian flu that he is now riding through in a humid Japanese summer – poor thing! We have been requested not to leave the house and to wear white Japanese masks until Hugo fully recovers in fear for passing on the flu to the locals! So we are now all in house arrest here at the beautiful Australia House in the hills of Urada, near Matsudai which is actually a marvellous place to be stuck! It is actually a relief that we have been forced to slow down and simplify our days as there is so much to absorb already. We were moving at quite a rapid pace in Tokyo and then to Tokamachi meeting so many wonderful and important people and taking in a whirlwind of newness. We are blessed with the generosity of our hosts and local volunteers who tirelessly assist us with any need. Daisuke has also been a wonderful help translating for us and accompanying us to both the City Mayors office and the hospital! Yoko San is a local school art teacher from Niigata City who has volunteers her weekends to generously show us where we can buy this or that, how to navigate hardware stores and find other local treasures. She also has leant us a whole lot of interesting books about Japanese art and supplied us with art materials. 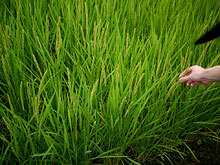 We are starting to grasp the scope of the word 'satoyama'. Coming from the characters for ‘cultivated field’ and 'mountain', it not only describes this place where human settlement meets the woods, it talks about how nature and humanity connect and co-exist across time and place. Some of the local delights we have already been fortunate to sample is the delicious carrot juice which is more like a sweet nectar. The carrots become sweet and dense in the winter months while buried under snow. I have also been enjoying the local grown mild filter coffee infused with local chrysanthemum and the calm & steady energy it gives to work through the heat. The attention to detail and precision in everything is astounding, from the traffic man in his LED flashing high-vis vest, elegantly waving red and white flags to the mosaic pattern of rice paddies terraced on the hills. We are also very excited by the local industries we are finding, there appears to be stone masons working with granite, paper making, specialist tool manufactures near by in Joetsu and large concreting companies and we are yet to find the wood workers. This is beginning of a large and long-term project and we feel really very lucky to be having this experience and now we can't wait to really get started. 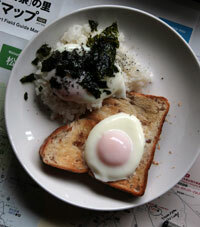 Heidi's transitional breakfast: eggs on toast or eggs on rice or both! View from the upstairs window at Australia House including a mobile of all the business cards we have been given, a reminder of all the people we have met. 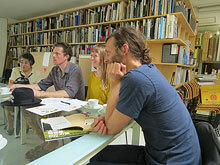 Sydney-based artists Heidi Axelsen, Hugo Moline and Nathan Hawkes arrived in Japan today to participate in the Australia House Artist-in-Residence Program 2013-2015. 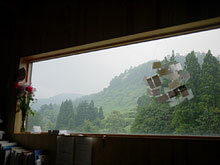 The artists will stay in Echigo Tsumari on a number of occasions, starting this summer, with the ultimate goal of exhibiting their artworks at the 2015 Echigo-Tsumari Art Triennale. They will be staying at Australia House for around 20 days this time. Before departing for Echigo Tsumari, they met with General Director of Echigo-Tsumari Art Triennale Mr Fram Kitagawa and his colleagues, as well as staff from the Australian Embassy in Tokyo. The artists expressed their excitement about their participation in the program. On the same day, the International Culture Appreciation and Interchange Society, Inc. presented the inaugural Asa Matsuoka Award to the artists. The Asa Matsuoka Award, named after the founder of the society, is awarded to artists - such as those who come to live and work at Australia House- as part of efforts to promote friendship and goodwill between Japan and countries in the Oceania region. The award was presented by Ms Yuko Matsuoka , Executive Director and daughter of Ms Asa Matsuoka, and board member Professor Muneaki Samejima. Get creative at Australia House! What can you make in Urada? Participants in this Workshop will be able to interact with the Australian artists-in-residence and experience the creative process first-hand. Everyone is welcome! Visitors to Australia House will be treated to some Australian and Japanese snacks and refreshments. Join us for afternoon tea - eat, drink and have some fun! 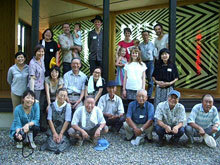 Come and meet the Australian artists-in-residence for a fun interactive Aussie afternoon in Urada. Everyone is welcome! The views expressed by any contributors to this site are those of the individual contributor.